i'm playing on my iPhone at the moment. I just love travelling and visiting sunny places so here are my top guides to some great holiday destinations you might like to go see for yourself. Are you working in the radio industry? Then here's some information that you may find useful. Elvis Presley was one of the most successful entertainers in the music business. Find out all about his career and links to more Elvis stuff. Check out the results of the last polls from the site all archived away for prosperity. It makes for some interesting insights as to what my visitors think. Looking for a new job in Radio? Then check out the latest radio, TV and media opportunities. Want to spy on what's going on in the studio? Here's a few radio studio webcams to be checking out. If your station has a web cam let me know and I'll add it to the page. There is so much good music being produced every week it's hard to keep up with it all. Here are just a few of my favourite video tracks at the moment. 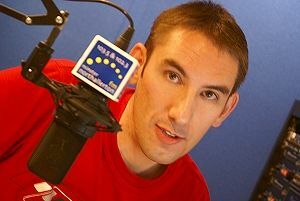 Hi there I am a freelance radio presenter in the UK and this site is all about radio broadcasting and my radio career. If you're working in the industry then you will find loads of information and resources for your radio show and a few anoraky pages for when you're bored. Feel free to send me stuff to share with others, be it show prep or just pictures of your radio station to add to the collection. For my other visitors there are loads of jokes, fun stuff and information to keep you occupied for 5 minutes or so. Why not vote in the polls there's different ones on rotation and you can see the results of past questions in the archive. Getting in touch is as easy as clicking the Say Hey! button at the top of each page. I get lots of emails so thanks for all your comments and feedback. To get back here to the home page from anywhere within the site just click on the Paul Denton logo in the top left hand corner of each page. You can listen to me online at www.ClassicOldies.co.uk every weekday afternoon from 2pm - 5pm for the Afternoon Oldies Party. Listen again to some classic tunes from 50's and 60's. If you're up Saturday mornings why not join me for the 'Down At The Diner' show from 9am - 1pm.